The Hammer Cup 2016 was a great time. It was fun to participate, it was fun to play all the maps. And of course huge thanks to Phillip and the judges. Congratulations to everyone who took part, and to Phillip and RunThinkShootLive for organizing this event! Plenty of great stuff all around and an exciting boost to the Half-Life 2 fandom not often seen these days. THC was a fantastic resurgence in the mapping community, the level of motivation and quantity of work was great! I really enjoyed the set of 5, can’t wait for the next one. Thank You Phillip for all your hard work, The Hammer Cup was a great success, I can only hope there is a Hammer Cup II. To the people that entered the Hammer Cup I enjoyed playing all the maps and hope you continue to produce HL2 maps in the future. 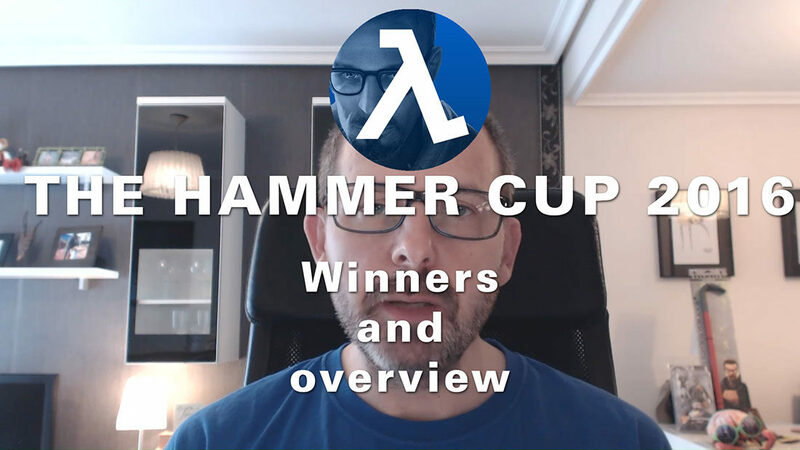 Thank you everyone involved in creating those wonderful maps for The Hammer Cup 2016. As a non-modder I can still appreciate the effort that goes into even the shortest of maps and in turn enjoy playing them. Some are amazing and some are merely okay, but that is still good because they bring new ideas for an admittedly old game! Thank you Phillip and to all the modders who submitted. I am not a modder myself, but am absolutely grateful for all the time and effort that gets put into the challenges. I love the HL universe, and you all keep it very much alive for me and everyone else here. Thank you! keep it up phillip and thankyou again !